Counterbores, surface planing cutters, cutters, planing tools. SAFETY WARNING: Make sure the maximum RPM of the item you choose below, is more than the RPM of the power tool you are using. RPM of power tool cannot exceed (must be less than) maximum RPM of these items. Diamond counterbores for quick, precise planing in pipe flanges, bathtubs, etc. May be used in portable drills. Shank diameter and length, and pilot diameter and length, are made to order. 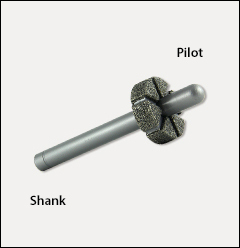 Order using the cutter diameter listed below, and contact us with the shank and pilot dimensions you require. 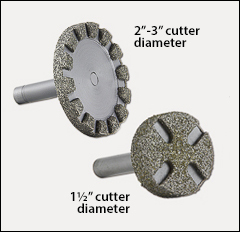 Diamond coated surface planing cutters for improved cutting action when surfacing/planing flat surfaces. Made for drill press or milling machine. Below cutters are shown in the most popular spindle size. Shaft diameter and length can be made to your specifications. Please call for a quote on the size you use.